^ a b Г.В. Талина. Царская власть в XVII веке: титулование и положение. ^ a b c d Gardiner(1985),p.291. ^ a b c 加納格【国家評議会】『ロシア・ソ連を知る事典』(1989),pp.211-212. ^ a b c d 岩間他(1979),p.318. ^ a b c 保田孝一【ミール】『ロシア・ソ連を知る事典』(1989),pp. 571-572. ^ a b c 田中他(1994),p.30. ^ a b c 森安達也【ラスコーリニキ】『ロシア・ソ連を知る事典』(1989),p.617. ^ a b c 倉持俊一【ドボリャンストボ】『ロシア・ソ連を知る事典』(1989),pp.400-401. ^ a b c 岩間他(1979),p.252. Conway Maritime Editors (1979). Conway's All the World's Fighting Ships, 1860-1905. Wh Smith Pub. ISBN 978-0831703028. Gardiner, Robert (1985). Conway's All the World's Fighting Ships: 1906-1921. Naval Inst Pr Pub. ISBN 978-0851772455. Livesey, Anthony; H. P. Willmott (1994). The Historical Atlas of World War I. Henry Holt & Co. ISBN 978-0805026511. Millar, James R. (2004). Encyclopedia of Russian History. MacMillan Reference. ISBN 0028656938. Slocum, John W. (1998). Who, and When, Were the Inorodtsy? The Evolution of the Category of 'Aliens' in Imperial Russia. Russian Review, vol 57. Watts, Anthony J. (1990). The Imperial Russian Navy. Arms & Armour. ISBN 978-0853689126. Bonnell, Victoria E.; Ann Cooper, Gregory Freidin (1994). Russia at the Barricades: Eyewitness Accounts of the August 1991 Coup. Armonk, NY: M. E. Sharpe. pp. 371. ISBN 9781563242717. Condee, Nancy (1995). Soviet Hieroglyphics: Visual Culture in Late Twentieth-Century Russia. Bloomington, IN: Indiana University Press. pp. 208. ISBN 9780253314024. Saunders, Nicholas J. (2004). Matters of Conflict: Material Culture, Memory and the First World War. New York, NY: Routledge. pp. 224. ISBN 9780415280532. Dixon, Simon (1999). The Modernisation of Russia, 1676-1825. Cambridge: Cambridge University Press. pp. 288. ISBN 9780521371001. Chakirov, Nikita, ed (1971). Illustrated History of the Russian Empire: The Coronation Book. Astoria, NY: The Russian Orthodox Youth Committee. pp. 488. Englund, Peter (2002). The Battle That Shook Europe: Poltava and the Birth of the Russian Empire. New York, NY: I. B. Tauris. pp. 288. ISBN 978-1860648472. Freeze, George (2002). Russia: A History (2nd ed.). Oxford: Oxford University Press. pp. 556. ISBN 9780198605119. Kappeler, Andreas (2001). 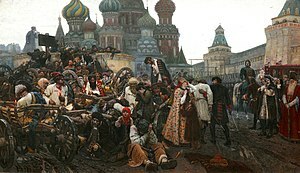 The Russian Empire: A Multi-Ethnic History. New York, NY: Longman Publishing Group. pp. 480. ISBN 9780582234154. Hughes, Lindsey (2000). Russia in the Age of Peter the Great. New Haven, CT: Yale University Press. pp. 640. ISBN 9780300082661. Longley, David (2000). The Longman Companion to Imperial Russia, 1689-1917. New York, NY: Longman Publishing Group. pp. 496. ISBN 9780582319905. Moon, David (1999). The Russian Peasantry 1600-1930: The World the Peasants Made. Boston, MA: Addison-Wesley. pp. 396. ISBN 9780582095083. Waldron, Peter (1997). The End of Imperial Russia, 1855-1917. New York, NY: St. Martin's Press. pp. 189. ISBN 9780312165369. Westwood, J. N. (2002). Endurance and Endeavour: Russian History 1812-2001 (5th ed.). Oxford: Oxford University Press. pp. 656. ISBN 9780199246175. Hingley, Ronald. The Tsars, 1533-1917. Macmillan, 1968. Saunders, David (December 2000). “Regional Diversity in the Later Russian Empire”. Transactions of the Royal Historical Society 10 (10): 143-163. doi:10.1017/S0080440100000074. ISSN 0080-4401. Warnes, David. Chronicle of the Russian Tsars: The Reign-by-Reign Record of the Rulers of Imperial Russia. Thames & Hudson, 1999. Russian Empire: All about Russian Empire and Russia (Russian).